“Please, just one more picture” is the plea my husband Tim often hears as we drive the back roads of rural Ohio, a camera in my right hand and a well-worn map in my left. As we approach yet another of the famous landmarks, the words “Chew Mail Pouch Tobacco” come into focus and we slow to find a safe place to pull off the road for a new photo opportunity. I have been pursuing my unique-but-not-unheard-of hobby of photographing Mail Pouch barns for approximately seven years. That’s the answer to the second most common question I’m asked. The most frequent, “How did you ever get started doing this?” takes more time to answer. I grew up in rural Jefferson County, Ohio, in the tiny town of Bergholz. There were no Interstates there to get to and from the places we needed to go, so I became familiar with the rural routes and back roads of the scenic Ohio Valley. 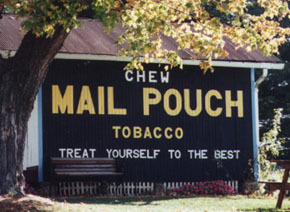 I frequently saw the “Chew Mail Pouch Tobacco” and its partner, “Treat Yourself to the Best,” in my local travels. As I grew older, graduated from college, and moved away, I missed these reminders of my youth. Preserving these memories via photographs had been on my mind for some time and one day, as I was driving through Pennsylvania on my way home from New York, I spotted a red Mail Pouch barn. As I pulled over to the side of the road I thought, if I don’t take this picture now, I can’t say when I’ll return here again and the opportunity will be lost. So I took the photo, and my hobby was born. After that first step, I was anxious to photograph all the Mail Pouch barns that I was aware of. Once I accomplished that, I found any excuse to travel on a back road in hopes of discovering another barn. As the years passed, I eventually photographed all the barns between my old home in Bergholz and my new home in Fairfield County. Now, when I have time, I will take a longer route, just to search for barns. I even planned our honeymoon so that we would travel through the back roads of West Virginia and Virginia. By the time we were married, Tim was used to my bizarre hobby and willingly pulled to the side of the road whenever a barn came into view. I have gradually learned a lot about this unusual form of advertising. A crew of painters did the signs. 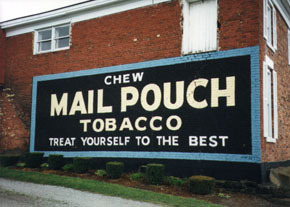 They painted the slogan on the side of a willing farmer’s barn in exchange for a choice of several things, such as cash, magazine subscriptions, or of course, a hefty supply of Mail Pouch chewing tobacco. Another popular option was that the farmer could have the rest of his barn painted. The last living Mail Pouch painter, Harley Warrick, joined the crew when he returned from service in World War II. The crew happened to be at his parents’ farm painting a sign on their barn, and they needed an extra pair of hands. Mr. Warrick joined them on the spot. 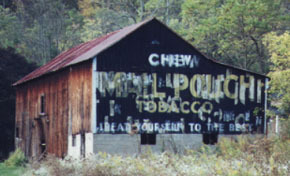 Warrick estimates that he painted or repainted over 20,000 barns and signs throughout his career. Retired, he now lives in Belmont, Ohio with his wife, where he spends time painting birdhouses and mailboxes in his workshop for sale to visiting enthusiasts like me. I was anxious to meet this man and discuss his work. I found Warrick in his workshop, dressed in his trademark garb---bib overalls and a flannel shirt. He didn’t mind chatting with me, and said that I certainly wasn’t the first to visit. As he looked with amused interest through my scrapbook of over 200 Mail Pouch barns, he would occasionally make a comment about one picture or another, or remember something about the owner of the barn. One story which he shared with me was about the man who owns the Buckeye Candy and Tobacco Company in Bucyrus, Ohio. Warrick bet the unsuspecting owner a steak dinner that he could paint the Mail Pouch slogan on the side of his business in a mere afternoon. The skeptical owner took him up on the bet, and lost! It usually took Warrick about four hours to paint the side of a building. He also said that his first 1,000 or so signs looked like he’d painted them with his feet, but eventually he got the hang of it. At one time there were more than 10,000 of these landmarks dotting the countryside in the Midwest (and a few along the West Coast), but now less than half remain. Unfortunately for enthusiasts such as myself, this number grows smaller every day as the old barns succumb to time and the elements. Many are torn down, while others simply fall down or are brought down by high winds or tornados. Eventually there will be no Mail Pouch signs as Warrick has retired and long ago gave up trying to hire a replacement. A few interested young men gave it a crack, but none stuck with it. Another hindrance is the tax placed on advertising for any billboards or signs within a certain distance from the highway. According to Warrick, the company which produces Mail Pouch is unwilling to pay this steep tax to continue the advertising. 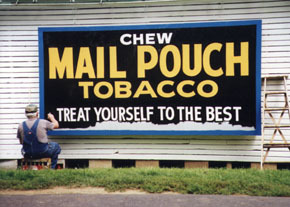 Probably the highlight of my hobby was seeing Mr. Warrick paint a Mail Pouch sign at Malabar Farms near Loudonville, Ohio during the summer of 1997. A bib-wearing Warrick painted the famous slogan one last time in front of a small but excited group of Mail Pouch enthusiasts. The small crowd watched, fascinated, as a huge gray panel of wood was slowly transformed into one more example of disappearing Americana. As he worked, members of the audience asked questions that ranged from the content of the paint he used (a mixture of lampblack and linseed oil) to the coffee table book he is currently writing with the help of his daughter. When he finished the sign, Warrick autographed memorabilia which people had brought along, and even paused to have his photo taken with various dedicated “fans.” I consider myself lucky to have been one of the few people to actually witness Warrick painting one of these signs. I found myself humbled that day after talking to a nice older couple from the Cleveland area. They were amused that someone of my age would be so interested in something they considered very yester-year. I was telling them proudly about my accomplishment of locating almost 250 of these barns when they casually mentioned that they have found over 4,000 Mail Pouch barns and signs in their travels. They were kind enough to share some location information with me, as did the other persons there. Since then I have found a handful of other people who share my hobby, and I find that they are all very friendly and helpful about trading information. But our numbers are few, and our ways to find and contact each other are limited. I hope that this article will inspire those of you who share this interest to contact each other via The Barn Journal’s Guest Book and exchange information on barn locations, magazine articles dealing with Mail Pouch, Mr. Warrick, and other facts related to barn sign painting. I will be happy to share any information that I have with you. I hope to help as many people as I can to find the barns that are out there, because it is only a matter of time before the only existing Mail Pouch barns will be in our photographs. Eddie Robberts resides at Lancaster, OH with her husband Tim and their two cats. She is a 1993 graduate of Muskingum College and currently teaches English in the Lancaster City schools. In her spare time Eddie enjoys reading, gardening and, of course, road trips.